From left: Battelle’s Bruce Jezek, honoree David Winkel, and NBC Industry Group officials Rebecca Robertson and Justin Haynes. 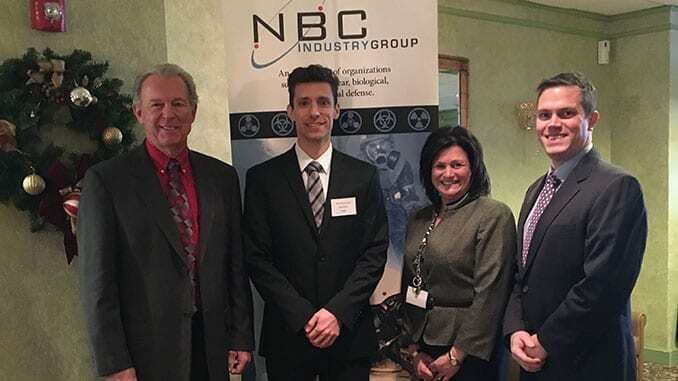 Leaders in the Nuclear, Biological and Chemical (NBC) industry gathered Thursday in the historic Joint Base Myer-Henderson Hall to recognize one of the industry’s most promising young researchers—Battelle’s David Winkel—with the Dr. Billy Richardson Award. For 25 years, Richardson was instrumental in the development of modern chemical and biological defense programs. He served as the Deputy Assistant to the Secretary of Defense for Chemical and Biological Matters and as the Technical Director of the U.S. Army Chemical Research, Development and Engineering Center. The Dr. Billy Richardson Award for young NBC Researchers recognizes young leaders who are committed to nuclear, biological and chemical defense. Winkel is the third Battelle researcher to win this award. The NBC Industry Group, of which Richardson was a founding member, was established to support national and international chemical, biological, radiological, nuclear and explosive defense activities. The group recognizes the importance of being ready in the event our country faces the threat of Weapons of Mass Destruction as well as other hazards. An 11-year employee at Battelle, Winkel has tested joint service general purpose masks and various types of chemical detection equipment, participated in field tests with tracer gases to validate contaminant transport models, and conducted field tests with the explosives detection canines that, among other roles, secure the nation’s airports. Winkel has led several key tasks for Department of Homeland Security’s Science and Technology Directorate in support of its Biological and Chemical Terrorism Risk Assessment (TRA) programs. These programs conduct comprehensive analyses of the risk of biological and chemical terrorism to the United States. Winkel’s contributions include advancements to their respective public health response and medical mitigation models, which estimate the number of individuals who can be saved by the actions of the public health response system. Winkel holds a Bachelor’s of Science in Chemical Engineering from the University of Dayton and a Master’s of Science in Chemical Engineering from The Ohio State University. Battelle is an official media sponsor of Global Biodefense.